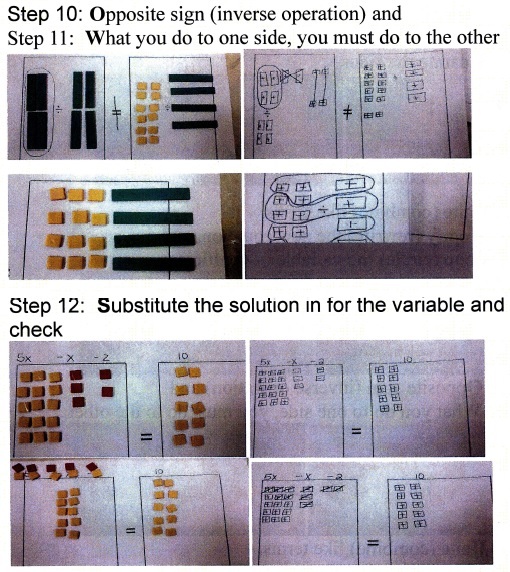 All too often math topics are introduced first with the skills and steps. This is backwards. 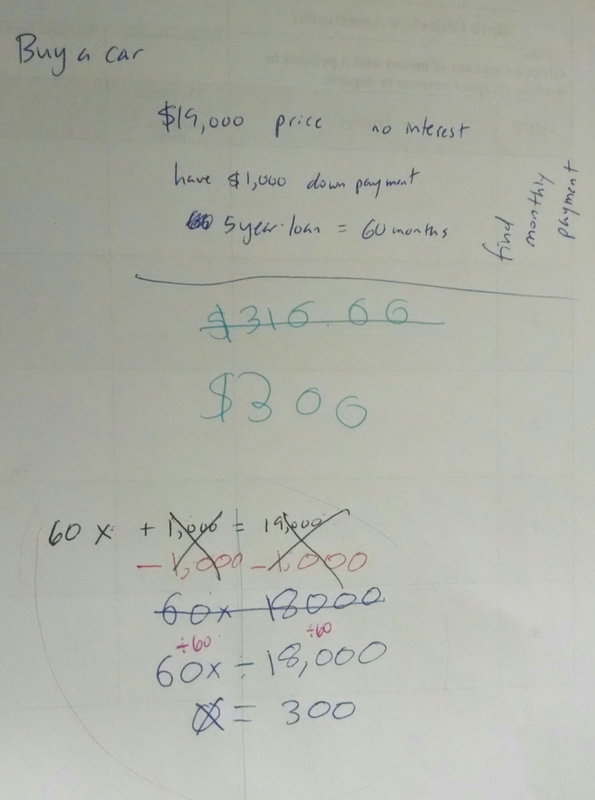 The photo above shows how I introduced solving equations a high school student with autism using the concept as an entry point. 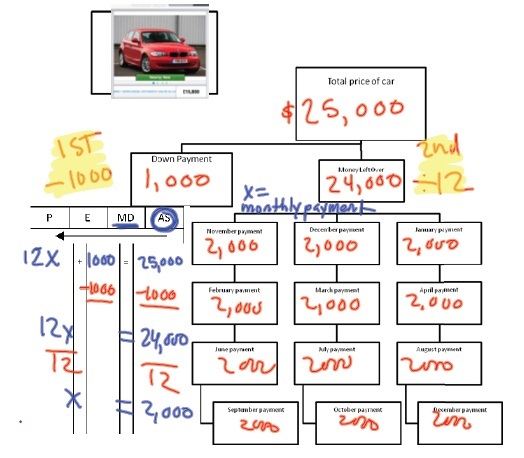 We discussed what was involved in buying a car, including payments (no interest) then I posed the problem seen at the top. I asked him to figure out the monthly payment. He worked out the problem, overlooking the down payment. With a minimal prompt he self corrected. I followed this by “showing him the mathy way of doing the problem.” (Seen in the bottom half of the photo). He conceptually understood why the -1,000 was the first step and x had meaning. This is a version of CRA. This is a photo of a handout from a special ed conference shared by Dr. Shaunita Strozier (sstrozier@valdosta.edu) of Valdosta State University. It shows the use of algebra tiles to provide a concrete level of the concept of an equation and solving the equation. The photos on the left show the R or representational level of the concept. 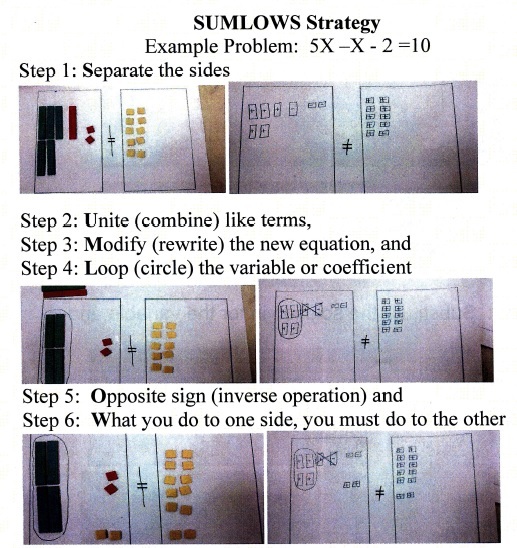 Her approach is called SUMLOWS which is an acronym explained in this handout.